'Knight has probably done more than anyone to shine the light of serious critical understanding on the Robin Hood material for scholars, students, and enthusiasts alike.' John Marshall, Arthuriana, Volume 26, Number 2, Summer 2016, pp. 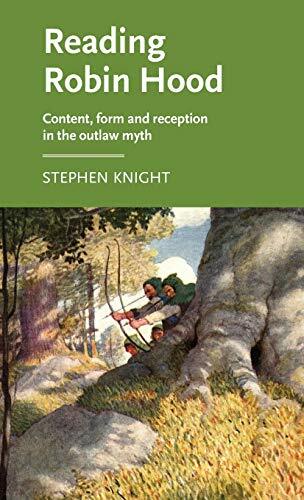 141-143 'Knight has once again produced a detailed, scholarly text that is sure to be of use to Robin Hood scholars for years to come, and my own research owes a debt to Stephen Knight for having made the later tradition a serious area of scholarly inquiry.' International Association for Robin Hood Studies, December 2016 'When Knight returns to discussing the rhizomatic tendencies of the Robin Hood tradition in the last chapter, he creates a compelling reflection on not only the status of these texts, but also on his teaching career and Robin Hood studies itself, a field that owes its success to his efforts. As a scholar who has hitherto primarily encountered Stephen Knight's scholarship on Arthurian texts, his description of trying to form a course on Robin Hood may sound familiar to anyone who has pitched a "Special Topics" class on material they think should receive special attention. He makes the interdisciplinary, wide-ranging secondary work on Robin Hood sound like an exhilarating and viable alternative to the more conventional avenues of traditional scholarly work. In an academic market that necessitates scholars legitimizing themselves by any means necessary, Knight provides a compelling if optimistic model for how Robin Hood studies has legitimized itself and may continue to do so.' James Howard, The Georgia Institute of Technology, Robin hood scholars blogspot 'In his usual meticulous style, Knight draws together disparate threads of scholarship within this rhizomatic field of study, his distinct voice containing not only the attention to detail that one has come to expect from him but also a clear and unabashed enthusiasm for the subject matter.' Sabina Rahman, University of Sydney, Medievally speaking, November 2016 -- . This book explores and explains stories about the mythic outlaw, who from the Middle Ages to the present day has stood up for the values of natural law and true justice. Analysing the whole sequence of Robin Hood adventures, it begins with the medieval tradition, including early poems and the long-surviving sung ballads, and goes on to look at two variant Robins: the Scottish version, here named Rabbie Hood, and gentrified Robin, the exiled Earl of Huntington, now partnered by Lady Marian. The nineteenth century re-imagined Robin as a modern figure - a lover of nature, Marian, England and the rights of the ordinary man. In novels and films he has developed into an international figure of freedom, while Marian's role has grown in a modern feminist context. Even to this day, the Robin Hood myth continues to reproduce itself, constantly discovering new forms and new meanings. -- .